Let us begin by examining the development of some very simple perceptual functions in normal children. Consider visual acuity as a first example. A number of studies using various methods (Fantz, Ordy, and Udelf, 1962; Gorman, Cogan, and Gillis, 1957; Dayton, Jones, Aiu, Rawson, Steele, and Rose, 1964) find the visual acuity of infants between zero and 1 month of age to be between 20/150 and 20/400 Snellen. It increases over the first several months of age and then rapidly through childhood, reaching maximum (20/20 to 20/15 Snellen) about the age of 10 years (Weymouth, 1963). Consider auditory acuity as a second example. Steinschneider, Lipton, and Richmond (1966) found neonates sensitive to sounds of 70 db or more. 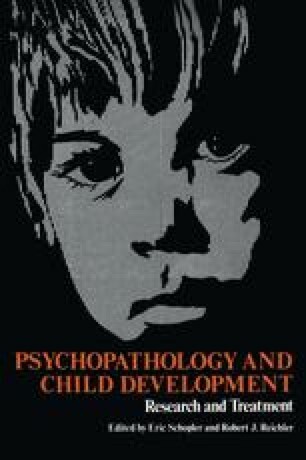 Bartoshuk (1964) found that the function relating responsivity and intensity of sound in neonates was similar to that of adults, and Eagles, Wishik, Doerfler, Melnick, and Levine (1963) found auditory acuity increasing slowly and gradually between 5 and 13 years with a slight decrease in sensitivity at 14. Even somewhat more complex perceptual functions such as those involved in size constancy seem to show gradual improvement with age. Typical of these studies is one by Zeigler and Leibowitz (1957). Children between 7 and 9 years of age showed less constancy than a group of adults in adjusting a rod 5 feet away to match the size of one varying from 10 to 100 feet away.